It’s crazy to think that we’re entering the last few weeks of Summer. So, with this great season coming to a close, we think everyone should close it out on a high note! And we have just the event. We are one of several amazing businesses in Eagle sponsoring the Eagle Septemberfest this year, and hope that you’ll join us! This awesome event is jam-packed full of live music, train running and local food, craft beer and cocktails, all taking place in beautiful Eagle Ranch Village. If you haven’t purchased your tickets yet, there’s still time! Click here to buy then now. Eagle Ranch Village is located on Capitol Street between Founders Avenue & Sylvan Lake Road, Eagle, CO 81631. Click here for directions. There will be some parking available at Eagle Ranch Village. (Please access the venue from the east side on Sylvan Lake Road.). There will also be street parking available in Eagle Ranch, but just keep an eye out for signs with parking rules. 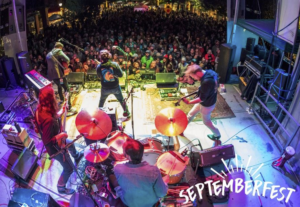 For even more information, including the festival schedule and bands that will be playing, visit the official Septemberfest website. We hope to see you there!